If you don’t know who Christopher Dove John Simpson are, then you may have been hiding under a rock! Seriously, the above video will give you an idea the professionals these two are. This was their first major show together as a team at Premiere Orlando 2015. Christopher Dove John Simpson have over 50 combined years of beauty industry experience. They have each achieved global recognition, awards, and accolades for their body of work in education, print, television and film within the industry. In education and mentoring, they have acheived lead creative positions with major hair manufacturers, salon organizations and individuals. As leaders in the hair and beauty industry, their combined collaborations of hair coloring, cutting and finishing work are internationally recognized. Together, they CoCre8 their framework of education to salon professionals, conveying the message of inspiration and skilled discipline through technique and love of the craft. They encourage the industry to reclaim and regener8 their passion and creative expression, and they always leave their audiences craving more. And yeah, they claim to be a little crazy and funny too! 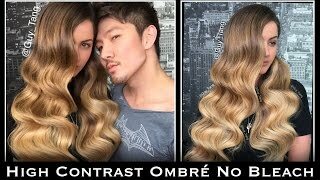 Every ticketed stylist that comes to the Saturday night Christopher Dove John Simpson VIP show receives $75 in ReGenesis/Revitalsh product free! 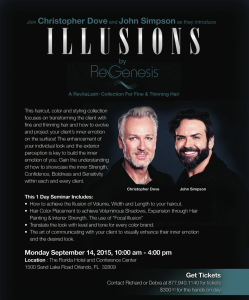 Also, everyone that buys a hands on Christopher Dove John Simpson ticket for Monday receives one of everything from ReGenesis/Revitalash. About $1000 worth of product! Plus the new trend release styling book based on fine hair creations from John and Chris. This is only a $300 investment to train under two NAHA award winners…and…get nearly $1000 in free products! There is only about 15 of the 30 spots left…will you be one of the lucky 30? And where have you ever seen a deal like that? Remember that this hands-on class is from 10:00 to 4:00 with two two-time NAHA award winners. The best of the best. I have found out that the hands-on class is a real-time learning experience. 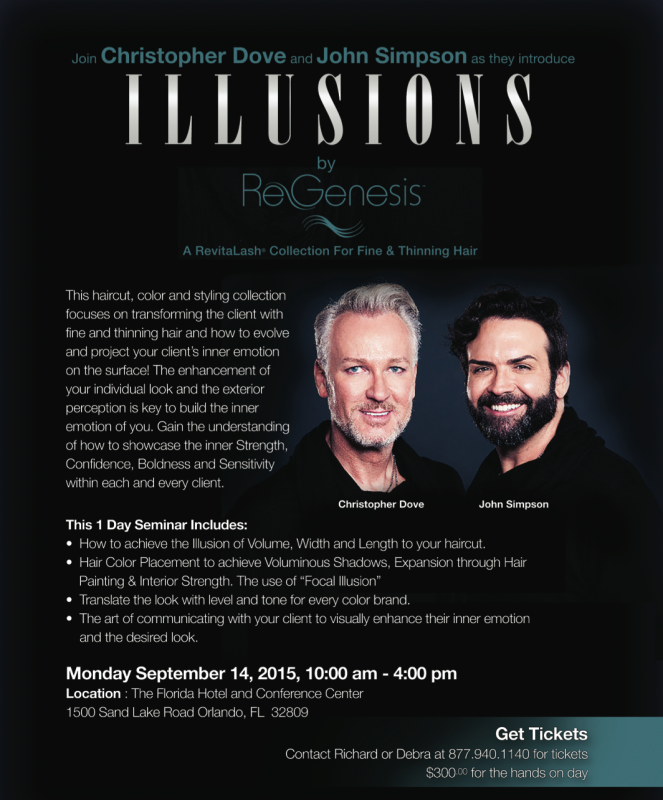 Chris and John will both do a cut and a color demonstration from their latest fine hair trend release. Stylists will have the trend book to look at the release while Chris or John explain how the look was achieved. Then they will all do the cut at the same time on mannequin heads. When Chris is cutting, John is helping the stylists, as well as other members of their team. Once the first cut is completed, they will teach the color application used on the trend look and again all do it in real time. After the first look is complete, they will break for lunch and come back for John’s trend release look while Chris is working with the students. The venue, The Florida Hotel is a destination all in itself. The hotel is actually attached to the Florida Mall, so there is no charge for parking! There are lots of choices for food with hundreds of shops for a great shopping experience. Also, Disney, Seaworld, and Universal Studios are about 10 minutes away if you want to extend your stay. We were able to obtain really great rates for our customers attending the show at only $119 per night! The Florida Hotel is really a beautiful 4-Star hotel offering great rooms with comfortable beds and widescreen HD TV’s and a fridge. The amenities include an Olympic size pool, business center with Mac computers, full fitness facility with weights, Starbucks, restaurant, lounge, and a convenience store! The Taming of the ‘Do has been one of the best education focused shows in the south for the past 3 years, and this year promises to be the best one yet! Besides Christopher Dove John Simpson, we have a great lineup of artists from: Scruples, Rusk, Brazilian Blowout, Z.One Concept, Neuma, White Sands, Framesi, and more! If you would like to be notified of new posts, please subscribe to my email list on this page. Thanks for reading and please comment below if you have seen Christopher Dove John Simpson in person. What did you think of them as artists and as a team?